The latest industry news and analysis—across all categories—listed in chronological order, with the most recent articles first. James Pike on the future for Cookes and other multi-generational independent retailers. Pure CF has been restructured via a prepack administration process in a transaction that saves the jobs of all of the contract furniture maker's employees. Like-for-like retail sales dipped in November according to the British Retail Consortium with more spend transferring online as Black Friday promotions become "increasingly digital." FIRA International, the furniture test house and industry services provider, has revealed its new brand identity as it continues its integration with its new owner. Italian sofa maker Natuzzi has chosen Cardiff for its first Natuzzi Editions showroom in Europe. It will open alongside a number of new Natuzzi Italia branded stores across the UK within the next few weeks. Premium kitchen makers Smallbone of Devizes and Mark Wilkinson Furniture have been sold to a high net worth American investor in a prepack deal that secures the near-term future of both heritage brands. Contract furniture maker Godfrey Syrett has told employees that it could close one of its sites in the North East in order to secure the business' near to mid-term future. Big ticket spend intention among UK shoppers worsened in November according to a closely-followed consumer confidence survey, but is unchanged year-on-year. House of Fraser says its Kendals store in Manchester — slated to close because it couldn't agree new terms with the landlord — will now not shut after it belatedly struck an accord with the building owner. Floorcoverings supplier Designer Contracts has featured in The Business Reporter’s ‘Best of British Business’ campaign, which highlights nationwide success stories across all industries. Beales, the department store chain recently bought by its chief executive Tony Brown, has completed a buyout of two-store East of England retailer Palmers, a deal that had been in the pipeline since the summer. Accountancy regulator delivers disciplinary formal complaint against KPMG and one of its partners alleging misconduct for work prior to Silentnight's sale in 2011. The complaint is "wholly without merit" according to KPMG. North West upholstery fabrics supplier Fryett's said it sees 'significant opportunities' for exports as overseas sales comparatives outperformed its much larger UK revenue base in 2017–18. Wayfair, the American ecommerce giant fast becoming one of the UK's largest furniture retailers, has raised $500 million (£391m) from bond investors through the issue of convertible notes. Dutch LED lighting specialist Calex Holland, one of Europe's key suppliers in the category, has joined the roster of brands to exhibit at Light, the new dedicated event at January Furniture Show 2019. Hampshire based Peter Green, one of the country's largest independent single-store furniture retailers, posted skinnier profits as sales declined in the year to March 31, 2018. Global home furnishings retailer IKEA says it plans to absorb the cost of transforming its business over the next few years at the expense of the bottom line. Malcolm Nix, the former Sleepeezee, Wood Bros and Michael Tyler Upholstery executive, has been appointed UK main agent for Tuscan sofa maker Gradi Living. Forte, one of Europe's largest makers of ready-to-assemble furniture, recorded lower revenue in the third quarter despite higher sales in Western and Northern Europe and in its domestic market. Seasoned retail executive Nigel Oddy is to leave his post as CEO of circa 150-store home and leisure chain The Range, according to trade journal Retail Week. Britain's three largest supply groups increased their share of a declining upholstery market last year and were responsible for more than one in every six sofas sold in the UK by value. Sales at department store retailer John Lewis & Partners topped £230 million last week, which included Black Friday, making it the highest grossing week in its 154-year history. Shire Beds has invested nearly £750,000 on new mattress making equipment for its Roll and Rest programme with the product line responsible for an increasing proportion of its business. Strong mattress sales helped the home category return to growth as John Lewis & Partners posted the highest grossing week in its history in the seven days to November 24. The company behind the direct-to-consumer bed brand Emma says it shifted €5 million of mattresses across Europe over the Black Friday weekend (Nov. 23–26). Canburg, the company behind high-end kitchen businesses Smallbone of Devizes and Mark Wilkinson, has filed a notice of intent to appoint administrators, according to Sky News. Corporate filings indicate a restructure may be imminent. Sales and profits jumped for furniture and furnishings chain Harry Corry Interiors in the first period since it finished its landlord-only Company Voluntary Arrangement (CVA) which it had seen it secure rent reductions. Floorcoverings group Victoria has decided to emphasise paying down debt with borrowing reaching what its board sees as "an internal ceiling" after it completed major acquisitions in the past year. Essex furniture and interiors retailer Roomes says it has taken steps to put the business on sound footing after a year where big-ticket sales were impacted by consumer uncertainty. DFS has opened a new store at Westfield White City in London, one of only a handful of stores based in shopping centres for the UK upholstery market leader. Two U.S headquartered investment outfits now own a shade under 40 percent of the shares in Victoria, the acquisitive British flooring group, after further stock building last week. Sleepeezee is to exhibit at the IMM Cologne exhibition for the first time ever as it looks to escalate the size of its international business, part of a plan to double its revenue over the next four years. Bed maker Sleepeezee is to allocate nearly £3 million towards building up brand awareness among consumers as it looks to get more customers asking for its products by name in partner retail stores. Premium upholstery retailer Wesley Barrell has temporarily closed one of its showrooms while it resolves property maintenance concerns with the store landlord. Retail footfall fell over the weekend taking in Black Friday promotions according to Springboard, a consultancy measuring shopper numbers in different types of retail destination. Private equity firm Sun Capital is proposing a bond issue as a means of extracting some of the latent value in Dreams, the beds retail business it has owned since 2013. Major independent invests in new assets and property arm delivers growth. Nasons might have been one of Britain's best retailers. It still might. "From July, Nasons will have its own website," the independent retailer wrote in accounts filed 13 long years ago. JYSK, the Danish value furniture retail conglomerate, says its planned opening in Ireland next year will mean it has stores in every major European country. Mattress Firm, the largest bedding retailer in the U.S and a key cog in the Steinhoff International Holdings network, has emerged from Chapter 11 having completed its reorganisation plan. East Midlands independent retailer Swannacks Furnishers of Retford is to close after the fourth generation owner of the company decided to retire. Furniture and flooring chain AHF was one of several interested parties in taking over either the Nasons furniture store in Canterbury or its brand, according to administrator Kreston Reeves. IKEA, the world's biggest home furnishings retailer, says it plans to restructure its business in order to adjust to "never seen before" changes that are rapidly transforming the global retail sector. AO World, one of the country's largest electricals retailers, is looking to leverage its logistics network and expertise by building partnerships with external furniture businesses. European home and living ecommerce retailer Westwing says it is now profitable as it balances revenue growth with cost control. Home sales at John Lewis & Partners were down for the second straight week in the seven days to November 17, but it did write more furniture and flooring orders than the same period last year. ScS, the UK's number two sofa retailer, will tell shareholders at its AGM later today that core written orders remain ahead of year-earlier trade but that growth has slowed in the past month. The decision to pull away from kitchen fitting services was behind more than half of a fall in B&Q sales in the past three months, the home improvement giant said today. Mattress seller Simba Sleep says it is nearing the completion of another funding round that will take it to "the next level." It declined to comment on a Sky News report saying it had cut its valuation as part of the process. Having introduced occasional furniture to its product roster this summer, fashion retail conglomerate H&M has taken another step into the home category with the launch of its first UK H&M Home store. Four-store furniture retailer Alan Ward said 2017–18 has proven to be "extremely challenging" but maintained that continuing improvements mean it is well placed to take advantage of any upturn. Steinhoff International Holdings, parent to UK chains Harveys and Bensons for Beds, says commercial director Louis du Preez will become its new chief executive officer with effect from January 1, 2019. Beaulieu International Group, the international textiles conglomerate, says it will increase prices worldwide at its Engineered Products division because of input cost pressures. IKEA, the world's biggest furniture retailer, is betting on the enduring value and appeal of city centres and will invest billions on real estate developments over the next three years. International money manager Invesco has continued its stock build in Victoria, the acquisitive flooring group headquartered in Kidderminster, buying up another tranche of shares last week. Oak Furniture Land, the circa 100-store UK hardwood furniture retailer, is close to opening its long desired first U.S showroom, and has chosen Boston as its launch city. 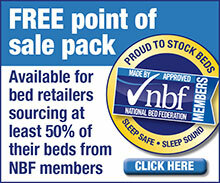 Heavy advertising has helped vacuum-packed mattresses become the fastest growing beds sub-segment according to twice-yearly research from the National Bed Federation, but it is not only those spending the cash who are benefiting. Home furnishings giant Williams-Sonoma will take its West Elm, Pottery Barn and Pottery Barns Kids retail brands to India for the first time after signing a franchise agreement with a local partner specialised in Western consumer brands. Bury based Cormar Carpets, Britain's largest carpet manufacturer, has made a seven-figure investment expanding its delivery fleet. A hoped-for rescue of adjustable furniture maker AJ Way & Co has fallen through leaving the High Wycombe business facing an end to more than 80 years of trading. It was placed into administration last Thursday.